Well, I'm all done working until the baby comes! (There is a slight chance I might work for a week or so right before she comes, but I'm waiting to see how I feel then.) I finished working as a preschool teacher back in April, I was a nanny for a little bit and that finished, and since then I've been working as a school crossing guard. Not that I don't take this job seriously- I do- but being a crossing guard for summer school has been a bit of a joke. Summer school at the elementary school I cross for lasted through the month of June and I think for that entire time I crossed and grand total of (drum roll please...) one child who was actually attending summer school! I crossed some neighbor kids a few times and they always asked me why I was still there. Yesterday I crossed a few older school-age girls and when they asked why I was there I told them it was because of summer school. They told me they were pretty sure nobody in their neighborhood was taking summer school. I told them I was pretty sure they were right. But no complaints. I have enjoyed sitting outdoors in my camping chair in a bright yellow vest in the mornings and reading the Little House books. I also occasionally crossed adults, but usually the adults who came through my area were joggers/ runners and they had sprinted across the street before I had a chance to ask if they needed to cross. No biggie. They are pretty good at watching for cars and not getting hit. So, mostly it has been a very low-key job (great for me and my oh-so-pregnant belly these days). However, there have been at least four (mildly) exciting things have happened while I've been on the job. 1. A bird used the crosswalk. Birds fly over that street all the time, but this bird flew down really close and flew right above the crosswalk. I wish I would have known. I would have held up my little stop sign for it. But it made it across okay. 2. I was tormented by a wasp. The little jerk thought he was real funny teasing me one day when I was trying to put away my little key that turns on and off the flashing school zone lights. All I had to do was turn off the last light and lock the key in its box and then I could go home. I think the wasp knew that. Right as I would finally think it had disappeared somewhere it would show up and buzz around the place where I needed to finish things up. I must have stood there waiting out that wasp for ten minutes. Finally, out of desperation, I said a quick prayer and asked for Heavenly Father's help. After the prayer I felt prompted to throw a rock at the wasp. I'll admit I hesitated a minute to do it. There were some Mexican guys who work at the ranch right next to where the flashing lights are who were just standing there watching me, which made me feel even more dumb. But I decided I'd said my prayer and so I'd better follow through, so I threw a rock at the wasp. I don't think I hit it (I don't really know), but I never saw it again. I finally turned off the flashing lights and locked up the key and went home. 3. A cop came to patrol the area one day. This was great. People speed through my traffic-cone-adorned, school-zone-lights-flashing, me-in-my-yellow-vest-and-stop-sign area all day without a thought that there might actually be a child around that they could hit. (Lucky for them there aren't really any kids around, but they don't know that.) I'm always pretty ashamed of the way people drive through that school zone. But, let's face it, there isn't exactly a whole lot I can do about it. When I was trained, my supervisor told me to not worry about it, but if cars ever sped through really fast, to go ahead and write down their information (license plate number, description of car, description of driver, etc.). Then I could call her with the information and she would pass it on to her supervisor (a cop) who would either write the person a nasty note or show up at their door and give them a little scare. This sounds like a fairly reasonable idea, except I'm still curious as to whether or not she was kidding when she told me this. Have you ever tried to write down that much information about a car that went speeding past you? By the time you think to yourself, "Hey, that car is going way too fast!" there is hardly time to see the license plate number, let alone get something out to write it down on. So mostly I just shook my head at the cars that sped through. But having the cop there was great. I think she pulled over three cars while I was there that day. There were plenty of other people speeding through that she could have pulled over, but you can't exactly make people wait while you go to pull over another car. Anyway, it was rewarding to watch after seeing so many people not take my flashing lights seriously. 4. Somebody totally drove over my traffic cones! This happened today and boy was I wishing that cop had been there to pull the person over. Little jerk. I had to walk out into the middle of the road and set them back up. And now there is a tire mark on one of my beautiful orange cones. How disgraceful. Since today is the last day of June and summer school is over, I now get to just hang out and do pretty much whatever needs to be done/ whatever I feel like doing until the baby comes. I'm pretty sure this is going to be the least-stressful time for the rest of my life. I'm gonna try and enjoy it. Yummy candy bar from Bryan with hand-decorated wrapping paper. Yay! My mom made a bag for the parachute so now it doesn't have to live in a garbage bag. Thanks Mom! Amanda and Kegan (our friends and across-the-stairwell neighbors). Kudos to Kegan for not making anyone cry this year. It was thunderstorming and pouring down rain all day which made me sad since I had planned to have the party outside on the lawn, but the rain did clear up long enough for us to go play with the parachute. Sorry to those of you who ended up with wet bums from the soaking wet grass. I love these girls. We were all roommates when we were single. I miss getting to hang out with them all the time like we used to back then. Also, thanks Mom! These are the shirts I got with the maternity top money you sent me for my birthday! Thanks everybody for celebrating my 23rd birthday with me! I had so much fun! It was so good to see all of you and enjoy some cake and ice cream together! I wrote this yesterday on my writing blog. It's hard to write anything very witty when I'm sad inside. Today was a good day, full of moving furniture out and moving furniture back in as they replaced the carpets in our entire apartment. So most of my physical activity for the day was consumed in preparing for that, waiting, and then putting things back in their place again. But my mind has been on my friend. I had a dear friend pass away today. His name was Bradley, but mostly I just called him Brad. So did everybody else. I wasn't his best friend. We were close friends, but I'm sure he had a lot of friends closer than me. Brad probably had hundreds of friends. I first remember meeting Brad when he showed up at auditions for Peter Pan when he was a freshman in high school. I was a junior then. Brad's older sister Kristin was a friend of mine and my older brother, so we were cheering for Brad to do well in auditions. Brad scored a lead role as John and was fantastic at it. I was a lost boy and so was Malcolm, a mutual friend of me and Brad. So, naturally, we became friends. I know it sounds cheesy to say and if I didn't know Brad I probably wouldn't really believe it, but Brad was one of those people you don't find very often in life. He was never mean to anybody. He was always sweet and nice. If I had been two years younger I would have had a major crush on him, but I was two years older than him and I didn't. Still, there was something addicting to being around Brad. He was just always so genuinely positive. Sure, we'd share in our beefs about life and things going on, but he was just always so much above gossiping and griping about every little thing. Brad was fun to play with, too. Being with Brad was like being seven years old all the time, not because he was immature, but because he was so pure of heart. He was always so full of laughter and good listening and some of the most fun scheming I've ever known. I always felt comfortable around Brad. I think everybody did. I think that's because Brad felt comfortable around Brad. Gosh, I miss him. I'm not really sure why, but for some reason today I keep thinking about my senior prom. Brad was my date. It wasn't anything romantic. Like I said before, I never had a crush on Brad and I'm sure he never had a crush on me. I wasn't dating anyone during the time of senior prom and I wanted to go with all of my friends, but nobody had asked me. I didn't mind asking a guy to be my date, but I didn't want to feel awkward all night. So, I asked Brad. I guess he couldn't really say no anyway. After all, he turned out to be one of the only two sophomores that got asked to the junior/ senior prom that year. (As I recall, the other one was his best friend. Lucky Brad. I guess he deserved good things to happen to him though.) Brad and I had a blast that night. We laughed secretly together at the other couples who were really into being romantic. And I think I remember playing hide and seek or something. I don't know. I just remember having a lot of fun. Brad was diagnosed with cancer a while back. I'm not as good at remembering the details as I should be, but as I recall he went through chemo for a while and got better. That was since I came away to college and I didn't see him much then. I think the last time I remember seeing Brad I was standing on the roof of the old garage at my parents' house, tearing away shingles. Brad came to visit and say hello. I remember looking down at him from the roof. I think I will always remember looking down at him from the roof. Perhaps Brad is looking down on me and his hundreds of other friends and his family now from the garage roof in heaven. That would be so like Brad, to volunteer to help tear off old shingles. Anyway, Brad was doing better for a while. As far as I remember he was doing pretty well when he came to visit me that day when I was on the roof. But for the past while his health had been going downhill. I worried for him and thought about him a lot. I wondered how long he would live, but was ashamed to say so. Then, this morning he passed away. It sounds cliche, but I know he's in a better place. Not that he didn't want to be here. Brad loved life and everybody in it. I guess that's why I don't worry about him. I'm sure he'll fit in so well in heaven. I just miss him is all. No doubt everybody who ever knew Brad is missing him right now. He deserves to be missed. Brad is worth thinking about all day and missing and crying over. He was so good. I think, like many, I wish I could have said goodbye. I wish I could have hugged him and laughed with him and watched him be silly one last time. On the other hand, I have no idea how I could have ever said goodbye to Brad. How do you say goodbye to a friend who is dying? What do you say? I certainly have no idea. And so things go the way they go. But I think I'll always miss him. And rightly so. When I look at the rest of your blogs I find your book lists to be much more intellectual-sounding. But there's no use in trying to pretend to be something I'm not (an intellectual reader, that is). I love children's novels, especially when they come in a series. The Provo City Library adult summer reading program has started again and Bryan and I joined up. We had such a fun experience with it last summer that we thought we'd do it again. Last summer I read the whole Chronicles of Narnia series. I remember starting The Magician's Nephew once when I was young, but I was very confused by the time I got to the wood between the worlds and, as I recall, I set the book aside and never picked it back up again. So last summer I finally picked it back up and read through the whole series. I loved it! I don't love reading, but I do love a good story. I think children's novels are good for me because it doesn't take long to get through a book and the stories are always great. 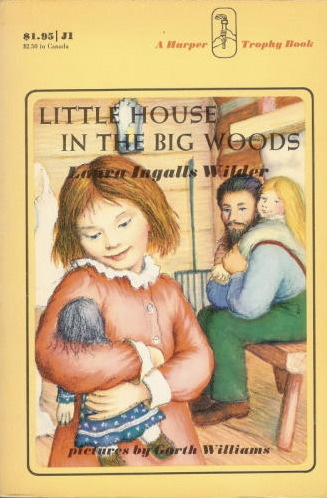 This summer I've started reading the Little House series by Laura Ingalls Wilder. I've already read Little House in the Big Woods and Little House on the Prairie. I'm now into On the Banks of Plum Creek and I'm almost done with it. 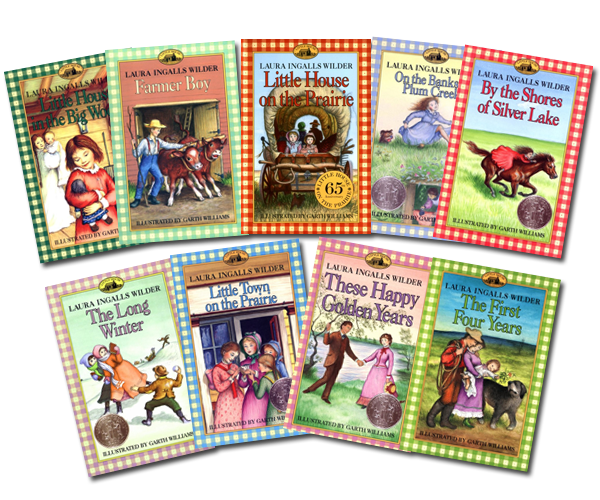 Unlike the Narnia books, I have read all of the Little House books before. Well, sort of. I remember my mom reading them to me before bed time when I was little. But it's been a long time and I only have a few memories of the stories and since I bought the whole series for pretty cheap last summer I thought I'd read them again. So far I'm really enjoying it. As a little girl I think I just loved the stories for what they were, but as a young adult and a new expecting mother I find myself bouncing back and forth between being able to relate to Laura and her mother. I'm simply amazed at all the work this family did. I can't get out of my head all the work the entire process was just to make cheese (Little House in the Big Woods)! But I'm even more impressed at how, although our work has changed, people are still basically the same. I think that's good. I think it just goes to show that technology doesn't make men different, it just makes their work different. That's all I really have to say about it for now. I'll let you know about other great finds I have while I read about the good ol' days. Me: "Are you doing the hand jive?" Bryan: "What's the hand jive? Is it a girl's camp thing?" 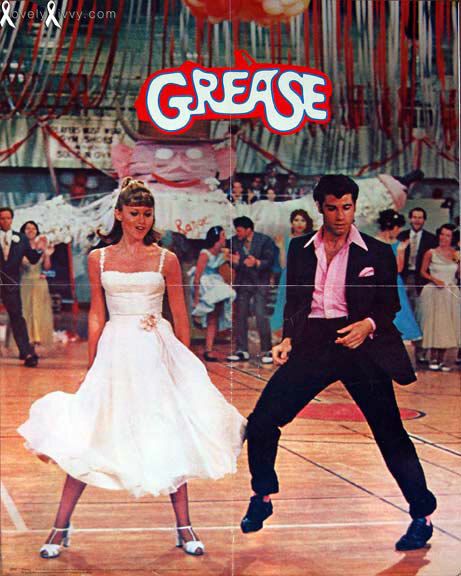 Me: "No, it's from Grease." If you want to read about how farmer's market went today, click here. Allow me to spark your interest by saying that a branch the size of a car fell about 5 feet away from us. Yikes! Bryan and me in front of our booth. Notice all that yummy granola next to us! Here's a picture of our booth from a couple of weeks ago. From left to right you can see: my sister Kendra standing in front of her handmade books, my friend Jenny's great baby things, and some misc. things I made (as well as a few things my friends Todd and Rachel made, but they're done with farmer's market now). And of course all of my great Sammy Jaybird onesies across the front. Yay! 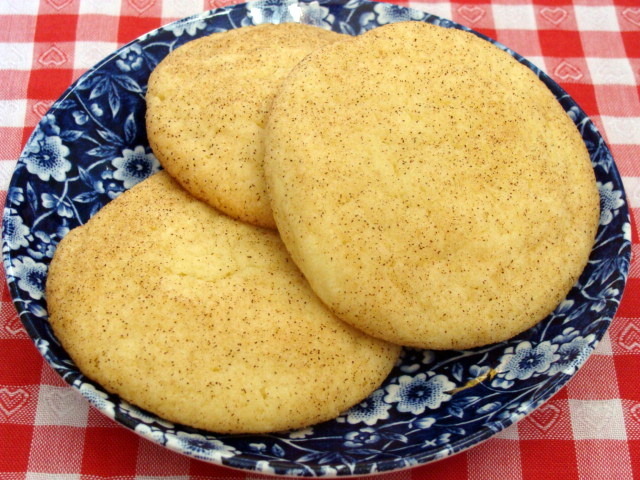 Well, I'm making this post late Friday night instead of early Saturday morning like I usually do because farmer's market starts earlier now that it's main season and it takes a while to get going in the mornings when I spend time making posts and things. Anyway, hooray for farmer's market this week! I'll be there selling Great Granola! in our three delicious flavors- raisin, cranberry, and blueberry- as well as great Sammy Jaybird onesies and hairclips! I've got some fun new designs you're going to love! I think sometimes goals stress me out. When I've got too much on my plate, for instance, I sometimes hate to make goals because I'm afraid I'm just going to feel like I can't get anything done if I ever fall behind or miss a day on a goal. But since right now there isn't a whole lot going on in my life, I thought I'd make a few goals. Goal #1: Take treats to everyone in the ward at some point by the end of December. Goal #2: Write every day for a year. I love to write. I have always loved to write. What can I say? My mother is an English Lit. teacher and she was in college for it when I was little and was teaching it at my high school by the time I was a freshman and I've just plain grown up living and breathing delectable, mouth-watering literature. (Let's not make it all sound like a dream though. I've read some pretty terrible stuff as a result of being my mother's daughter too. I have not yet forgiven you, Mom, for making me type up all those freshman poems when I was a T.A. for you during your prep period. One can only take so many terrible poems about kittens and boyfriends that probably won't last a month.) Anyway, I like to write, but I don't have very many occasions to now that I'm done with school and I'm working as a crossing guard and being a housewife (who only sometimes actually does any housework). So, in order to make this goal a little more rewarding, I've started a writing journal blog for myself. You can visit it here. I just started today. It might end up being a poem every day or I might write little essays or something. I'm leaving it open to whatever I feel like, so long as it's requires a little thinking on my part instead of just rattling things off like I do on here. Hopefully the things I write there will be a little higher quality and more polished. Hopefully. Well, I guess by "a few goals" I mean two. Anyway, that's about it. I'll be there selling Great Granola! in our three delicious flavors- raisin, cranberry, and blueberry- as well as great Sammy Jaybird onesies and hairclips! I've got some fun new designs you're going to love! My sister Kendra is also selling some awesome handmade books that will knock your socks off. See you there! Maybe there's a baby inside me. Or maybe I eat too much junk food.